States along the Atlantic Seaboard have turned in a solid economic performance in early 2017. Florida (228,000), New York (149,100), and Georgia (103,100) led the region in net job additions year-over-year (through May, the most recently available data). At the same time, Maine posted one of the nation’s lowest unemployment rates at 3.2%, down 70 basis points from a year ago. Several other states (New Jersey, Rhode Island, and South Carolina) registered jobless rates several ticks below the national average. The Southeast has been particularly strong, with growth in personal income in the national top tier for Florida, Georgia, and Virginia. New York, New Hampshire, Maryland, D.C., and both North and South Carolina also gained personal income in early 2017 at rates exceeding the U.S. average. 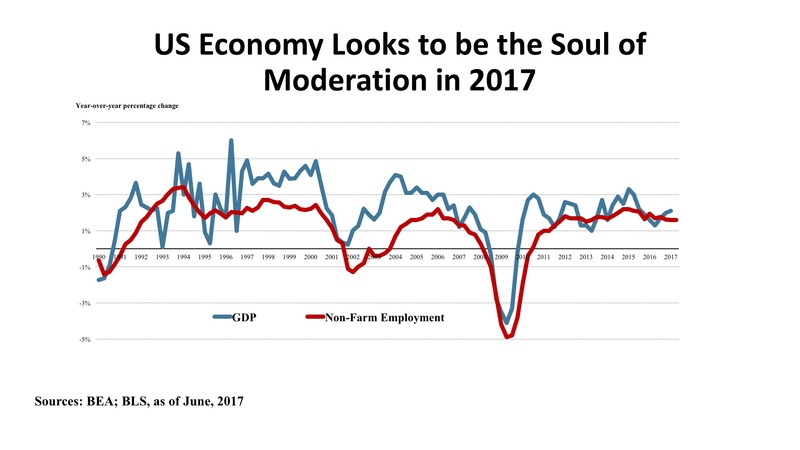 The most recent Federal Reserve Beige Book (July 12, 2017) reports moderate expansion picking up in both the Northeast and Southeast, with the Mid-Atlantic somewhat softer. Slow growth, however, is more due to constraints such as tight labor markets, low inventories, and buyer resistance to high real estate prices. Looking forward, opportunities for economic growth may depend upon what sector economists identify as “middle skill jobs.” Middle skill jobs require a high school education but do not demand a college degree. These jobs are prevalent in construction, building systems, transportation, and even in technician jobs in healthcare. Such jobs represent about 54% of U.S. occupations (high skill jobs are about 30%, and low skill jobs are 16% of the national total). Economic mobility in the future may come largely from workers’ ability to migrate from lower skilled job, which pay less and are more vulnerable to automation or outsourcing, to middle-skilled work. 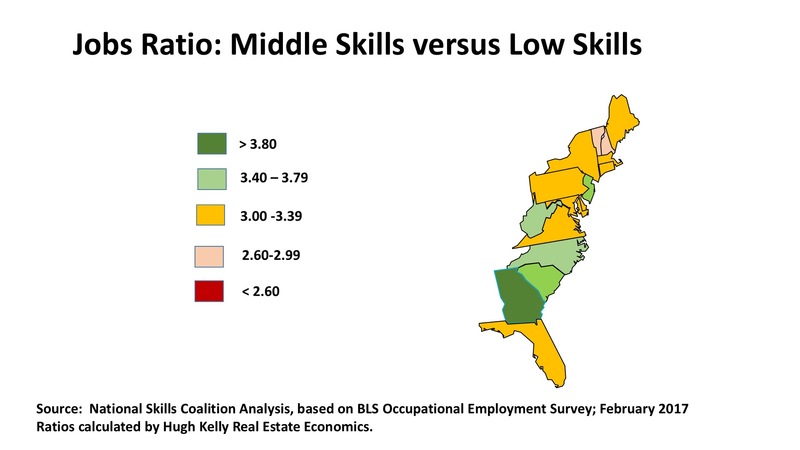 The accompanying map shows most Eastern Seaboard states have occupational profiles where middle skill jobs outnumber low skilled jobs by more than three-to-one, with Georgia, the Carolinas, and New Jersey especially strong. If, as many believe, it is particularly important that entry level jobs be the first step on an upward ladder of work, the East is in a good position to encourage such growth, even in a structurally tight labor market. Office. 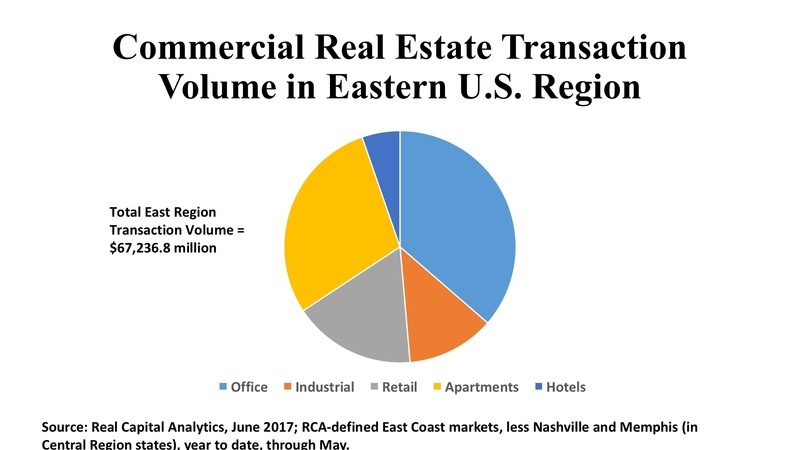 Transaction volume totaled $24.5 billion for East region states, year to date through May 2017. This was the greatest volume of any property type in any region and represented 48% of all U.S. office investment in early 2017. Manhattan, as usual, led the way with nearly $6 billion generated by just 38 deals. 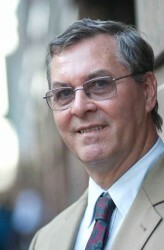 Boston was second, with 54 transactions aggregating $4.9 billion in acquisitions. Northern Virginia was the most active of the suburban office markets, with $1.6 billion in 18 deals, averaging a strong $361 per square foot. Charlotte’s suburbs attracted $1.2 billion, as 57 transactions averaged pricing at $218 per square foot. Northern New Jersey and suburban Philadelphia also posted considerable capital flows to office, with $911 million and $507 million respectively. Industrial. The East also led all regions in industrial real estate deal flow, with $8.2 billion representing 37% of U.S. investment in this property type. Atlanta is the East’s hottest industrial market, with $921 million in deal flow generated by 95 individual transactions, mostly in warehousing. Northern New Jersey ranks second, with 64 acquisitions summing to $783 in price. Miami/Dade is strengthened by its import/export activity, attracting $422 million in industrial property investment in early 2017. Westchester County, north of New York City, has a vibrant market for flex space, with $728 million dedicated to such properties in early 2017. Raleigh/Durham also shows solid interest in the flex/R&D sector, with $303 million in purchases of such space. Retail. This region also punched above its weight in the struggling retail sector, with $11.5 billion in store-based transactions accounting for 44% of all U.S. retail property sales price. South Florida is particularly active, with Broward County (Ft. Lauderdale) garnering $883 million in 40 shopping center deals. Miami/Dade follows closely with $781 million in transaction volume in 49 property sales. Atlanta comes next, $694 million committed in 67 purchases. Manhattan, despite the flood of “For Lease” signs on its stores, has the greatest volume of “high-street retail” investment, $903 million, flowing from 56 transactions with a staggering $1,976 average price per square foot. Boston and New York’s outer boroughs also see intense investor interest in urban shops, with prices per square foot of $697 and $674, respectively.